Pros: Enthusiastic performances and lovely set and costume design. Cons: The music overpowers the solo performances and on the evening I attended, the auditorium was so hot it was actually distracting. A pleasant but not particularly memorable trip down musical theatre lane. ‘Capybara.’ ‘Vug.’ ‘Oubliette.’ Did you know how to spell any of these words? Fortunately, now we both do. Centred on the titular uniquely American phenomenon, The 25th Annual Putnam County Spelling Bee features six tweens trying to spell their way to the national competition in Washington DC. It also involves overbearing gay dads, absentee mums in Indian ashrams, young love and lots of juice boxes. 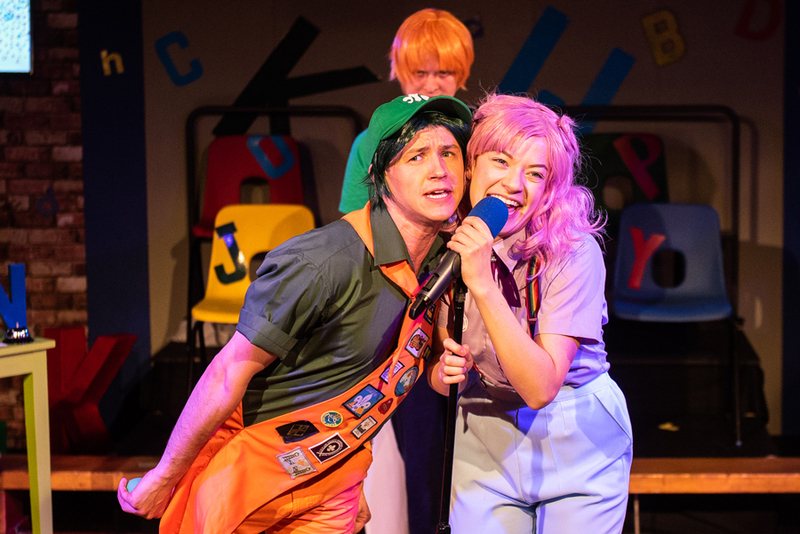 The cast of nine – our six spellers and three adults hosting the competition – tackle this quirky show with the enthusiasm only musical theatre people and (pretend) Americans are capable of. 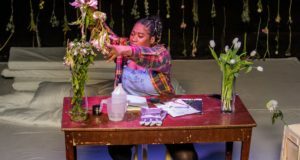 The story is woven through with a mostly harmless sense of humour, although this production has some added contemporary bite as well. “Your word is Windrush. Could you use that in a sentence please?”. “Sure. When no one was looking, Theresa quietly deported the Windrush generation.” A couple of barbs like this aside, The 25th Annual Putnam County Spelling Bee is an essentially sweet, good-natured story that stays firmly on track to its feel-good ending all the way through. The songs are pleasant enough, but not particularly catchy; by the time I got home, I was already unable to hum even a single chorus. The cast are ably supported by musical director Kieran Stallard on keys, although the solos are largely drowned out by the sound of the keyboard. It’s a real shame, because it’s here where the characters pour their hearts out, and even though I did get the general gist of each song I felt like I probably missed out on some of the most interesting bits. Outside of the songs, the rest of the show (unsurprisingly) involves a lot of people standing up and spelling words. It would be unfair to say this is about as engaging as watching paint dry, but it’s not exactly riveting stuff either. Director and choreographer Adam Haigh has livened things up nicely with some well-executed audience interaction (spoiler alert: you might be asked to try your hand at a bit of spelling yourself), but with two acts of 50 minutes, the running time really isn’t a minute too short. 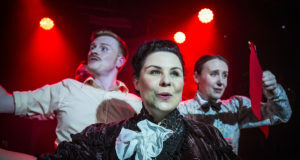 That is also the case because this particularly warm Thursday evening at the Drayton Arms Theatre is the perfect reminder of the dangers that await those intrepid enough to explore the London fringe in the summer months. Twenty minutes into the show I can feel the sweat trickling down my back. Of course, that’s a minor inconvenience compared to what the poor cast must be suffering; by the end of the first act, some of them look like they’ve just emerged from the shower. They bravely battle through until the end of the show, but obviously these are not ideal circumstances for either performers or audience members. On the upside, we’re distracted from the heat by some wonderful set design work from Victoria Francis, who has managed to fit a highly detailed school gymnasium into the small auditorium. The colourful letters pasted onto the walls and chairs, accompanied by the slightly wacky costumes and crazy hair colours, imbue the proceedings with a pleasantly Sesame Street-like vibe. 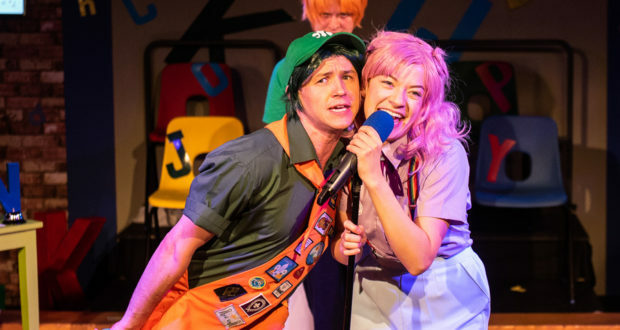 All in all, an evening at the The 25th Annual Putnam County Spelling Bee is a pleasant, undemanding outing. Although… do you know how to spell ‘weltanschauung’?